This blog comes with a warning: if you are a squirrel lover, you may want to skip this blog as I am a little aggravated with them. Last time I wrote about a backyard critter, it turned up pretty high on Google searches for articles about possums, and because that made people come to that blog, I (to this day!) get a lot of hate mail over that. Some just leave nasty comments, which you can see if you scroll through that blog. (Those are mild compared to the mail I get privately.) I thought it was pretty funny, but apparently possum lovers have no sense of humor. Warning number two: never call an animal ugly- as it will bring up the ugly in people. At any rate, I was home on vacation, (staycation) and looking forward to doing some writing, blogging etc. Right as the holiday was about to arrive, our WIFI went out. Completely out, dead out. My husband is a techie who can restore things like WIFI outages, but he was stumped. There was something really amiss with our WIFI and we had no signal coming into the house. As most of you know, we moved into a brand new home last December, a year ago. With that, new WIFI fiber optic cables were installed. What could possibly go wrong with one year old fiber optic lines? After a visit from a regular internet technician who was not able to restore our WIFI, we went into day 2 of no service. Still, that hot spot is a desperation move, because it goes in and out and it was frustrating. On day 2, technicians that run cables for WIFI came out to assess what was wrong. After a couple of hours, they took photos of what happened. Squirrels had chewed through our lines. It seems that there is some almond oil on the fiber optics, which makes for an ideal snack for the squirrels. Yum – an almond oil snack. They knew that this is a common issue that arises. 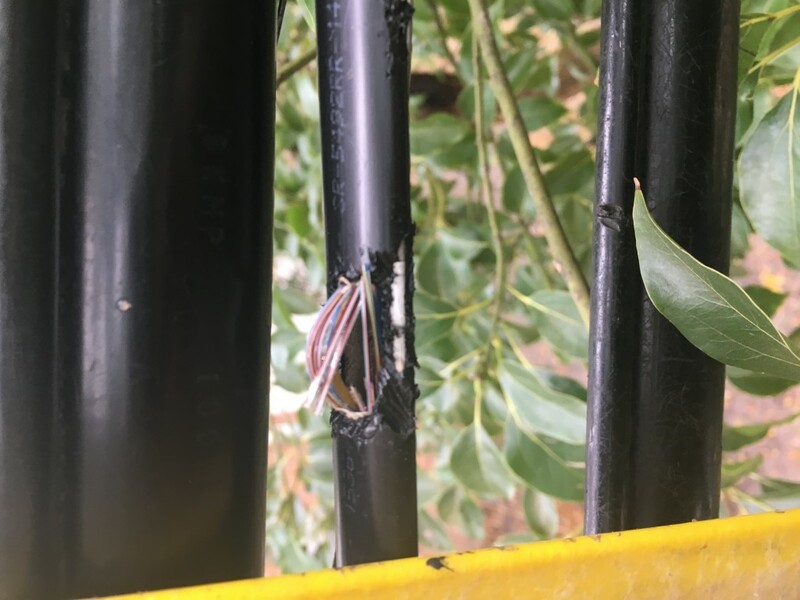 Here is the photo the technician took of the chewed through cable. On day 3, they ran new lines. It took until the end of day 3 to get the internet up and running again. Almost 4 days without, and I was pretty upset with those little squirrels, not to mention my concern over their ingesting fiber optic cables and having that in their tummies. After all, they are a lot cuter than possums, so my concern (in between my annoyance with them) was genuine. First of all, who was the genius who decided to put something appealing to squirrel appetites on fiber optic cables? Second, can’t they encase the darn things to protect them from being chewed through? Seems to be a pretty expensive thing to have to run new fiber optic cables, and we were not the ones who had to pay for it since it was not our doing. Of all the things we expected to go wrong with our internet, we never once thought it was those adorable little squirrels that love our backyard so much. Did you notice how many times I called the squirrels cute and expressed concern? Please squirrel and possum lovers, leave me in peace. I feel bad that you had to go without WiFi. It’s not quite as bad as my having to go 3 days, a couple of years ago, without heat, during one of our worst cold spells, in January! …Very funny, and cute, how you came to the defense of those sweet little squirrels! LOL.